The Kingdom of Annam was founded in 2874 BC. The modern Kingdom was unified in 1788 by the King of Hue, titled The Emperor of Annam since 1802. The Imperial Order of Dragon of Annam was created on 14th of March 1886 in the ancient Vietnamese city of Hue, by His Majesty, The Imperial Emperor of Vietnam, Emperor Dong-Khanh, ancestor of the current Grand Master, His Imperial Highness Prince Regent Nguyen-phuc Buu Chanh of Vietnam. The Order was originally created to reward and acknowledge those outstanding individuals who had performed both military and, non-military services to the Imperial Vietnamese House of Annam. In 1976, after the fall of the Democratic Republic of Vietnam, the Order was abolished by the Communist government of the day, however it was never a communist award and the "fons honorum" always rested with the Imperial House of Annam. At times during its honoured and revered history the Order of the Dragon of Annam was also bestowed by the French Colonial Government, and later the Republic of South Vietnam. However, the Order always was, and to this day remains the real, personal and dynastic property of the Imperial Vietnamese House of Annam. On the 30 October 2002, THE IMPERIAL ORDER OF THE DRAGON OF ANNAM was solemnly re-established under the protection of the Imperial Nguyen Dynasty of Vietnam, according to the Chapters and Articles established by the Order. The Order was re-established by His Imperial Highness Prince Nhiep Chinh NGUYEN-PHUOC Buu Chanh of Vietnam, with himself as Provisional Grand Master. Solemn ceremonies for the re-establishment of the Order of the Dragon of Annam were also co-ordinated in the United States, and held at Quang Minh Tu Temple in Illinois; the Bat Nha Buddhist Temple in Santa Anna, California; the Quan Am Tinh Xa Temple in California; the Phap Duyen Tinh Xa Temple, San Jose, California; Buu Mon Temple in Temple of Port Arthur, Texas; Co Lam Tu Temple in Seattle, Washington State. 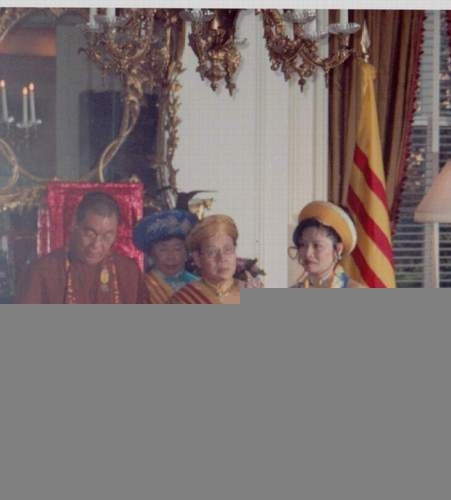 This was in association with the wishes of HIH Prince Nhiep Chinh NGUYEN-PHUOC Buu Chanh and the Imperial Nguyen Family. In the United States in July 2004, at a solemn ceremony held in Washington DC, and attended by members of the Imperial Nguyen Family and friends. The Most Venerable Hòa Thng Thích Giác Minh presented His Imperial Highness Prince Regent Nguyen Phuc Buu Chanh of Vietnam with the Imperial Nguyen Family Dragon-Ring. This most treasured and sacred Imperial Family gold ring, formerly belonged to the Emperor Khai Dinh. The Dragon Ring had long been entrusted to The Most Venerable Hòa Thng Thích Giác Minh, by the Dowager Empress Doan Huy Hoang Thi Hau Tu Cung, Empress and Consort of Khai Dinh, and mother of Vietnam's last monarch, Emperor Bao Dai. This ring was always presented by the Dowager Empress to the NEXT ruling Emperor. From the date of this most prestigious ceremony, His Imperial Highness Prince Nhiep Chinh NGUYEN-PHUOC Buu Chanh of Vietnam assumed the Imperial Family role of Prince Regent, and the appointment of Grand Master of the Order. In late 2004, a new Grand Master announced himself to the world. This (non-speaking), part Vietnamese gentleman attempted to organise a mirror organisation based on the Order of Saint Lazarus. This gentleman is the natural son of the late Emperor His Imperial Majesty Duy Tan. Such an organisation is non-Vietnamese and was set up initially by a small group of several very crass Americans, none of whom had ever spent a day in the military, and all of whom it should be noted went to great lengths to avoid being drafted during the Vietnam War. This group were also involved with the Hanoi government in an attempt to obtain communist honours for themselves, much to the disgust of the Vietnamese Diaspora. NOTE: The wife of His Imperial Majesty Duy Tan died without issue. The Grand Master, His Imperial Highness Prince Regent Nhiep Chinh NGUYEN-PHUOC Buu Chanh of Vietnam enjoys the recognition of the Imperial Council and the entire Vietnamese Diaspora worldwide, as well all Religious groups which make up the Vietnamese culture. The Imperial Order of Dragon of Annam is bestowed today as a personal gift from the Imperial Nguyen family to individuals, who have distinguished themselves by their personal endeavours and achievements on behalf of both the Vietnamese community and also the quest for a Democratic Monarchy in Vietnam. At times during its honoured and revered history the Order of the Dragon of Annam was also bestowed by the French Colonial Government, and later the Republic of South Vietnam. However, the Order always was, and to this day remains, the real, personal and dynastic property of the Imperial Nguyen Family of Vietnam. 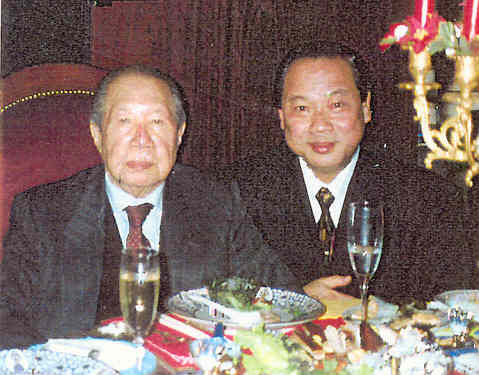 Photo caption: His Imperial Majesty Emperor of Vietnam Bao Dai with the Grand Master His Imperial Highness Prince Regent Nguyen-phuc Buu Chanh. Photo caption: His Imperial Highness Prince Regent Nguyen-phuc Buu Chanh being bestowed the Imperial Family Dragon Ring. Photo caption: The Imperial Order of Dragon of Annam Class III, as worn as a neck badge. 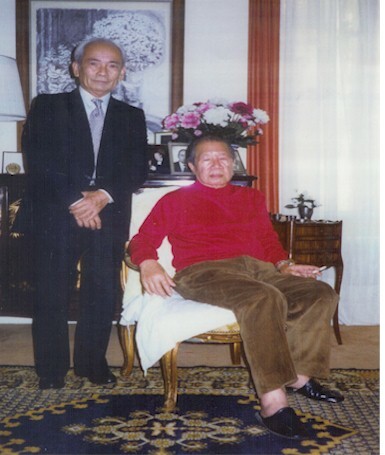 Photo caption: The Chancellor of the Imperial Order of the Dragon of Annam, His Excellency Colonel Tran Van Ba photographed with the late Emperor, His Imperial Majesty Bao Dai.